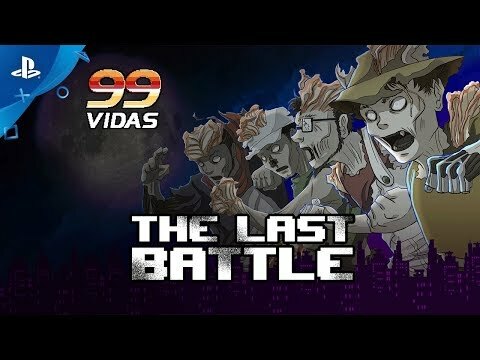 99Vidas is a "beat 'em up" set in a contemporary world that pays tribute to both the new and the classic in gaming industry. Brought to you in all pixelated, 16 bit-esque glory, chockfull of references to not only gaming, but all 80's and 90's pop culture. The Main Game can be played either solo or with up to a total of 4 Players, both Local and Online. It consists of 6 Stages, with additional 2 in the form of Bonus Stages, each of which culminates in a unique Boss Battle. The In-Game dialogs and even the Ending reacts to the amount of players in the game, as well as which characters are in said party, meaning that playing the game with different amount and combinations of characters may trigger unique dialog lines and change the Ending for each playthrough. The game controls consist of the directionals and 4 Action buttons - Punch (Quick/Weak Attack), Kick (Slow/Strong Attack), Jump and Super (Magic, which spends MP) - which can be combined with the D-Pad to produce combos and Special Attacks. The Player acquires Experience Points (XP), by defeating enemies and collecting items over the course of the game, which can then be used to purchase Combo and Skill Upgrades in the Upgrade Shops located in-between stages. Defeating Enemies also net the user Magic Points (MP) which increase the MP meter that once filled grants the player up to 2 different kinds of Super Attacks that damage all enemies on screen. New gamplay mechanics are introduced over the course of the game, including unique mechanics for the Bosses, to keep the experience from feeling stale.